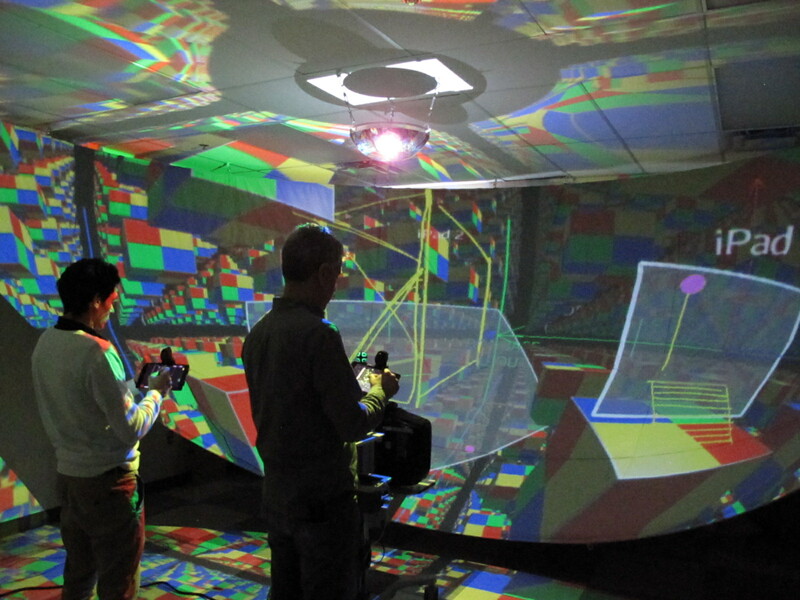 University of Montreal researchers have developed a collaborative 3D sketching system called Hyve-3D (Hybrid Virtual Environment 3D), which they presented at the SIGGRAPH 2014 conference in Vancouver this week. “Hyve-3D is a new interface for 3D content creation via embodied and collaborative 3D sketching,” said lead researcher Professor Tomás Dorta of the university’s School of Design. “The system is a full-scale immersive 3D environment. Users create drawings on hand-held tablets. They can then use the tablets to manipulate the sketches to create a 3D design within [that] space.” For example, they could be designing the outside of a car, and then actually stepping into the car to work on the interior detailing. The 3D images are the result of an optical illusion created by a wide-screen high-resolution projector. A 16-inch dome mirror projects the image onto a specially designed 5-meter-diameter spherically concave fabric screen. The system is driven by a MacBook Pro laptop, a tracking system with two 3D sensors, and two iPad mini tablets. Each iPad is attached to a tracker. The iPads are tracked in six degrees of freedom, meaning the iPad itself can be moved in three axes or rotated in three axes. Univalor, the university’s technology commercialization unit, is supporting the market launch of the system. We present the Hybrid Virtual Environment 3D (Hyve-3D), a new interface for 3D content creation via embodied and collaborative 3D sketching. Hyve-3D introduces a semi-spherical immersive 3D sketching environment based on spherical panoramas and uses 2D drawing planes that are intuitively manipulated in 3D space by the help of handheld tablets that are tracked in 6DOF. Orthogonal sketches created by the user on the tablet are used to build the 3D scene based on the position of the drawing planes.